In my first toastmaster speech I talked about how I listen to experience music. I’ve been wanting to write about it, so here it is. I use Spotify to stream my music. My requirements are simple. I need music to be where ever I am, I need a service with a large music library, and I need to be able to organize my library in a way that works for me. Spotify is by far the best at those three things. I am usually in areas with good data signal or a WiFi connection which makes it easy to stream my music without the need to download the songs. I do however keep a ‘data-less’ emergency playlist for the times when I am out of range with no signal. I keep about two dozen playlists that I listen to throughout the day as my mood changes. Some days I listen to the same playlist or even the same song over and over again. In total, I have twenty four playlists including the playlist I listen to when I don’t have a data connection and a playlist with a number of songs yet to be sorted. This year more than any other, music has become an important part of my life. I am not an expert in music, nor am I a musician, but music affects me emotionally, mentally, spiritually and even physically in tangible ways. I kind of need it, but In this post I want to focus more on how I organize my music. The handoff process between devices is top notch. I can start listening to a song on my computer, laptop, iPad, iPhone or even Google Home and move to any other device—including my computer at work—without missing a beat. The song continues playing right where I left of. Spotify also makes it easy for me to find new music. I can browse by genre, artist, and even mood (although this is useless for me—more on that a little later). The recommendation engine is usually spot on in my opinion—pun intended. I also recently started listening to podcasts on Spotify, so having both music and podcasts accessible in the same platform is nice. 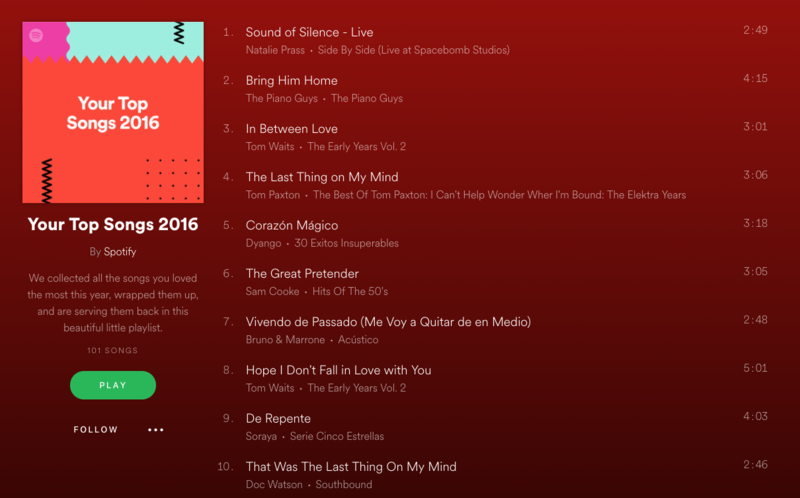 My favorite Spotify feature is the ‘Year in Review’ personalized page that Spotify creates each year for its users. It’s a personal page with the top songs played throughout the year. These are mine for 2016. This is my 2016 Spotify Year In Review. Some days I played ‘Sound of Silence’ by Natalie Prass around the clock. I thought it was interesting that different versions of the same song occupy 4th and 10th place. When I first started using Spotify, I had just finished reading Tom Allen’s book “Getting Things Done” and I decided to take a GTD approach to organizing my music. I created playlists based on contexts. I had playlists for work, home, car, travel, running, thinking, studying etc. The problem with this system was that I found myself never listening to some playlists. For example, my ‘travel’ playlist only got played when ever I traveled which meant that if I didn’t travel often that playlist wouldn’t be heard. A second problem with this system was that I needed to keep the same song in multiple playlists if I wanted to listen to it in different contexts. If I wanted to listen to D’yer Mak’er by Led Zeppelin at work and on the drive home, the song needed to exists in my ‘work’ playlist and in my ‘car’ playlist. This made me feel disorganized and it violated the DRY (don’t repeat yourself) principle that I try to apply in areas of my life other than programming. My second attempt at organizing my playlists was better. I realized that I listen to music based on my mood and not the different contexts in my life. So I began to organize my playlists based on mood. I created playlists with labels like happy, sad, angry, joyful, melancholic, thoughtful etc. This worked better. I could listen to any playlist whether I was at work or driving. My mood could cross contexts and I didn’t need to duplicate the songs. After a while I couldn’t remember where my songs lived or which mood I was experiencing. It started to get out of control. The bigger problem is that it took an unnecessary amount of mental energy to listen to my music because I couldn’t remember what song was in what playlist,. 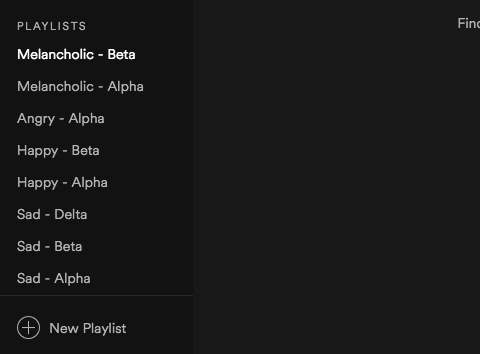 I got to the point where I didn’t know if I was feeling Sad - Beta, or Sad - Delta. I had to find another way. After a couple of years of trying a number of different strategies to organize my music, I remembered reading a story about Daniel Tammet the author of ‘Born On A Blue Day: Inside the Extraordinary Mind of an Autistic Savant’. Daniel has been diagnosed with a severe autistic disorder, but is still able to live a fully independent life and explain what is happening inside his head — yes I paraphrased amazon’s description. It’s a fascinating story worth reading. Daniel explains how he is able to see numbers in terms of shapes, colors and textures. He can perform incredible calculations and a number of other mental acrobatics. That’s when I got the idea of using colors to label my playlists. Colors, like moods and feelings are NOT binary. They run a gamut. I was already use to thinking about my feelings in terms of colors. I could say that some days I felt orange or blue and know exactly what I meant. And since no one else needed to know or make sense of my labels, this was perfect! I changed my playlists labels to blue, gray, black, orange, crimson, white, purple and so on. I had about twenty playlists and this system was working great. A year ago I moved to the Pacific Northwest. I spent a month or so on my own before my wife and mother moved. During this month and for the better part of the last twelve months I have experienced a myriad of feelings that were difficult to describe by a simple color name like blue, black, gray, white and the like. It makes perfect sense because not all grays, blues or reds are the same and neither are all the possible feelings a human can experience. I needed a wider color gamut that could account for differences in color hues. My best option was to use the RGB color spectrum. I have since made that modification to my labeling system. As a graphic designer, I was use to converting RGB color codes into CMYK, but I do very little print design these days, and I am more familiar with Hex (hexadecimal) color codes. Using Hexadecimal color codes was perfect, because Hex color codes are the RGB equivalent in web design. 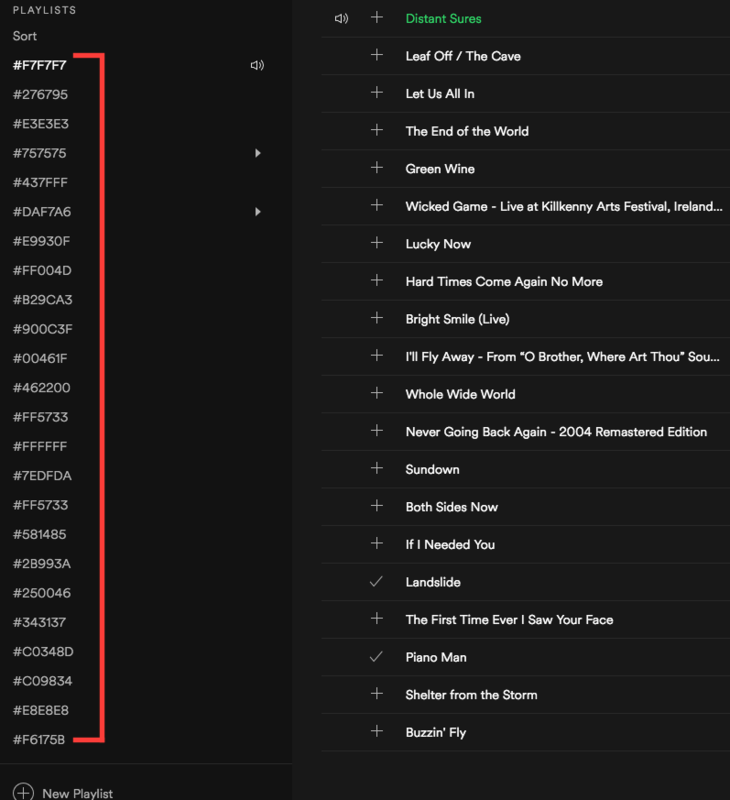 I have changed the playlists name from an English color name to a Hexadecimal equivalent. After a while I couldn’t remember where my songs lived or which ‘happy’ mood I was experiencing. Metamorfose Ambulante by Raul Seixas performed by Julieta Venegas y Maria de Medeiros.